Winter has almost bid farewell but that does not deter paratha lovers from biting into these delectable stuffed breads. I tried paneer parathas today and it turned out quite well. Paneer parathas are easy to make and are absolutely wholesome breakfast or any-time meal option. Another advantage is that it can be served hot with curd and pickle. No need to make any accompanying dish. Take whole wheat flour in a big bowl, add salt and warm milk. Mix and then add small quantities of water and keep mixing until you get a smooth dough. Add one tbsp cooking oil and mix the dough well until soft and smooth. Cover the dough and set it aside. Let the dough rest for at least ten minutes. Now to make the paneer stuffing, chop garlic/ginger garlic and green chillies into small pieces. Finely chop onion also and keep aside. If you find it difficult to chop finely, you could grate these ingredients. Bigger pieces will make it difficult for you to roll out the paratha with the stuffing inside. Grate paneer to very small pieces and keep aside. In a pan, add oil and splutter jeera. Add ginger garlic paste/garlic and chopped green chillies. When these are properly roasted, add onion and saute until pink. Add red chilly powder, turmeric powder, garam masala and saute. Add grated paneer. Mix well and cook for couple of minutes. Add required amount of salt. Turn off the fire and add lemon juice and chopped coriander leaves. You could also use aam chur instead of lemon juice. If you do not use onion, you can just mix the raw ingredients and make the paneer stuffing. Take a medium ball sized piece of paratha dough. Make a small smooth ball of the dough and flatten into a small cup using your thumbs. Place 2 tbsps of paneer stuffing inside this cup. Bring together all the sides to the center and seal tightly using the dough. Dip this ball of dough filled with paneer stuffing in flour, flatten it a little using your hands. Use a rolling pin to gently roll this dough coated with flour. If the dough sticks to the rolling pin or rolling surface, lightly sprinkle flour on both sides of the paratha. Roll gently till the paratha is about 1/4-inch thick. Do not make the paratha too thin. Heat an iron griddle on medium high. When the griddle is hot enough, turn fire to low. Place the paratha over the skillet. Sprinkle some oil on the sides. In about half a minute, you will notice the sides of the paratha turn brown and puff up in the middle. Cook on a low heat till golden brown. Use a spatula to flip over the paratha. Sprinkle few drops of oil. Cook until sides turn golden brown. Lightly press the puffed areas with a spatula. Flip again and press with the spatula making sure the paratha is golden-brown on both sides. Remove from the griddle on to a plate. Put a dollop of butter on the hot paratha. Serve with curd and pickle. 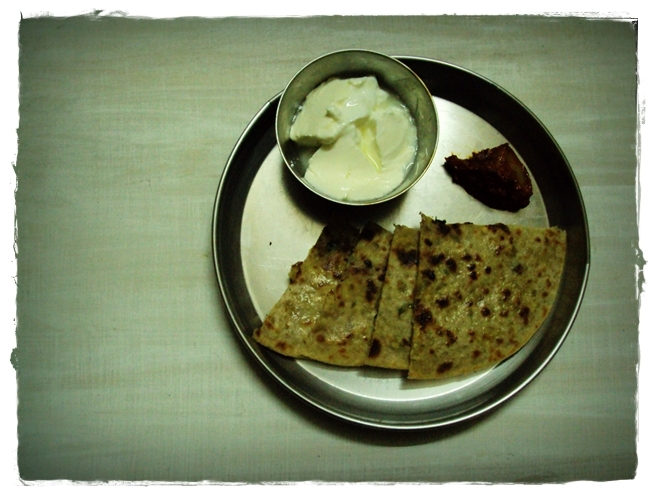 Parathas taste yummy even when cold and make a good snack for short journeys. It is fast to make and convenient to carry and does not require side dishes. A wedding that I attended recently had a good spread of starters and cocktails. Among the more predictable paneer tikka fare, there was an interesting crispy fried bread geneously sprinkled with sesame seeds. Though I like to pretend that I am only into health food and never indulge in greasy snacks, I let my guard down and relished a couple of these crunchy delights. Here I present my own less sinful version of what I tasted at the wedding. A quick fix breakfast or snack, an easy dish to make. If you are using square shaped bread slices, cut it into smaller rectangular or triangular pieces. This is optional and just for ease of eating. Spread/place the cheese spread/slice on bread (I used Amul’s Garlic Cheese Spread). On this sprinkle sesame seeds, and mixed herbs (I used pasta herb mix. Basil is also a good choice). I did not use any salt as I used garlic cheese spread which had little bit of salt. You could choose to sprinkle salt as per your taste. Brush olive oil on the free side (the side without toppings). Since I do not have an oven, I toasted this in a pan on low heat. Toast only the free side to make it brown. Serve as snack by itself or with vegetables. You wont realize how many of them you will gobble along with hot tea or coffee. Instead of cheese, you can spread mashed potatoes. Sesame seeds are rich in calcium. Multigrain bread and olive oil up the health quotient. Plantains are an integral part of Onam, the harvest festival of Kerala. Malayalis cannot think of an Onam without plantains. Keralites leverage plantain in all its forms and age. Raw plantains are deep fried and salted or jaggery coated to make chips, or used to make mezhukkupuratti (dry vegetable dish), erisseri, kalan etc. The ripe ones are steamed, cooked in jaggery, used to make payasam (kheer/sweet pudding), or eaten as is. The flower and the shoot (after peeling layers) are used to make dry vegetable dish. The peeled layers are used as binding ropes or for stringing garlands. Plantain leaves are used as plate to serve food and to make ela ada. In places with waterways, the shoots of a plantain are tied together to make a platform and used as a country boat. A very ripe plantain can be eaten as is without cooking. But semi ripe plantains should preferably be steamed or baked. I will share 4 simple recipes of ripe plantain here. One using overripe plantain and the other three using medium ripe plantain. Choose ripe yet firm plantain for steamed plantain. Slightly overripe plantains are best suited to make the jaggery coated plantain. This goes well with items like puttu or upma. It is also a healthy snack by itself. Peel the plantain and remove the ends and the peel. Cut into two-inch round pieces. In a pan, pour water and add the jaggery pieces and heat until the jaggery melts. Strain to remove dirt if any. Put the ripe plantain pieces into this melted jaggery, cover with a lid, and cook for 5-7 minutes. Remove the lid and stir in between to ensure that the bananas do not stick to the bottom of the pan. When the water content reduces, the jaggery syrup thickens, and plantain pieces become tender, add ghee and elaichi powder. Turn off the fire and serve hot. You can even serve it cold. If you use firm plantain, they turn hard when cooked in jaggery. So make sure that you use ripe or overripe plantains. Note: I used organic jaggery and hence the dark color. Jaggery available in the market are heavily treated with chemicals which reduces the natural intense color. Peel the plantain and remove the ends. Do not remove the peel. Cut into two inch round pieces. Steam them in an idli tray for 10 minutes until the plantain becomes tender. This is served with ela ada and fried papad for breakfast on the Thiruvonam day especially in the Malabar region. Plantains are fibrous and have high starch content. Steamed plantain is easily digestible especially for kids and the elderly and instantly boost energy levels. This is a sinfully yummy shallow fried treat. Peel the skin and cut the plantain into thin vertical slices. Smear ghee on the hot griddle and place the plantain slices on ghee. Cook for a minute in medium to low fire. Flip when you notice the bottom of the plantain is turning golden brown. Sprinkle sugar. Remove from fire when the other side is sufficiently fried/cooked. Another method of cooking plantain is to bake it in charcoal. Traditionally when meals were cooked using firewood, the coal would be hot even a couple of hours after all the cooking is done. Put the ripe plantains (with their skin) in between the hot coal. Make sure the plantains are fully embedded in the coal pieces. Take out after 5 minutes and smoky chargrilled plantains are ready. I saw yet another interesting variety here. Truly yummy variation. Check it out. Soft and chewy steamed rice balls with a tadka and grated coconut. An easy and yummy snack item also made during Ganesh Chathurthi. This dish is also made on the occasion when small children start crawling and crosses the doorstep (vashal padi). Kids of this age would be teething and Ammini Kozhukkattais are a safe option to bite into, any day much better than plastic teethers. Heat a teaspoon of sesame oil in a wide pan. Add one cup of water and salt and bring to boil. Mix the rice flour with a cup of water and add to the boiling water. Keep stirring continuously. When you can the dough leaves the sides of the pan and forms a thick lump, remove from the stove. Alternatively, you can make the dough by adding boiling hot water to the rice powder, stir, and make the dough. This method is effective but you need to ensure that the water is boiling hot. The idea is to ensure that the dough is half cooked at this stage. If not, the dough will not become soft and pliable to work on. Let the dough cool for 10 minutes. Smear a little oil in your palms and knead the dough. Take small quantities of the dough and make small marble-sized balls. Place the rice balls in an idli tray and steam in a steamer or pressure cooker for 20 minutes. Allow to cool. Heat a tsp of oil in a pan and crackle mustard, urad dal, chana dal and the curd chillies. When the mustard crackles, add hing and curry leaves. Add the steamed kozhukatais and stir for 5 minutes. Stir carefully ensuring that the kozhukatais do not break. Add freshly grated coconut and milagi podi (optional). Turn off and serve with coconut chutney. This is a healthy breakfast/snack item as it is steamed. Remember to lightly grease the steamer plate/idly tray in which you arrange the ammini kozhukatai for steaming. This ensures that they don’t stick to the plate. After the kozhukatai are steamed, turn off the heat and take out the plate/idly tray of kozhukatai. Let it cool off a bit. Wait for a couple of minutes before you touch them because they would be delicate due to all the steam and heat and tend to break easily.